Hello all. I have been reading the forum without an account for some time. I have to admit I am blown away by the support here. I LOVE the scientific answers- I have really learned a lot about mealworms that I had no idea! I was hoping you might be willing to share your knowledge with me, please. I would even be willing to offer compensation for a consultant. I have been small scale breeding mealworms for 10-15 years. I started in a glass aquarium. Then to a shelf full of tupperwares. And now a scaled down tier system with 20 trays. 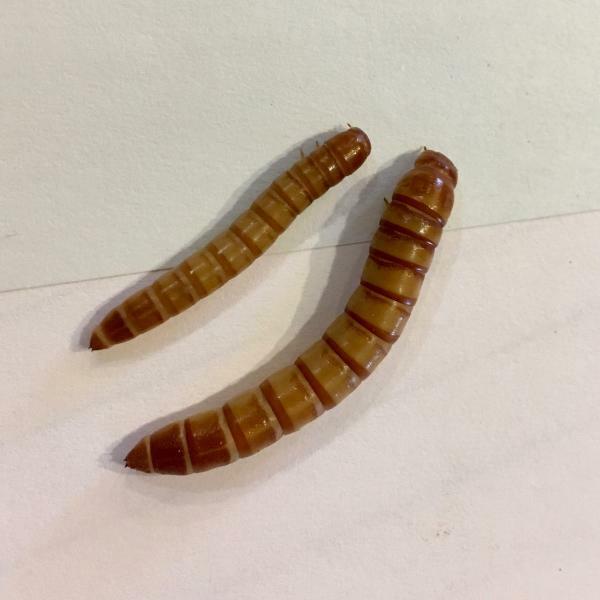 I sourced my mealworms online, and they are different than the typical mealworm. They are definitely not superworms. The mealworms, pupae and larvae are much larger than typical mealworms. Larvae are close to superworm size. I want to continue raising these larger worms, and don't want to switch to smaller ones. My tiered system is successful in raising plenty of worms. However they are very slow to pupate- MUCH slower than mealworms. This time of year pupation has nearly stopped. The temperature and humidity has remained relatively consistent year round. Lighting hasn't changed (they stay dark unless working on them). I would like to increase to a serious breeder. Not commercial, but I want to increase production 3-4x, with the current problem again being pupation. I am happy to answer any questions that can help to clarify my situation, I know there is much more detail than I included here. I greatly appreciate your time and expertise. Thank you! Hi heritageacres, - One thing that makes some insects larger is by them getting extra time in their developmental cycle eating. This can mean taking an extra instar phase instead of going to pupation as early as they potentially could. Lots of factors come into play regarding how many instars mealworms pass through. Presumably you are rearing this current breed under the same conditions as did historically for your older colonies & that newbreed is taking an extra instar (delaying pupation) under your standard conditions. To my way of thinking, based on size description, there is a genetic component you have involved. Exactly how that figures in to pupation is going to be speculative without you providing more details. You probably will need to isolate some larvae & determine how many instars seem to be involved with the new breed when kept under your current standard conditions. Then you can run experiments varying those conditions to see what may push them to pupate faster with acceptable trade offs in size and mortality percentage. Elsewhere in Forum the interplay of hormones has been discussed & will only say here that juvenile hormone has to change it's ratio in order for pupation to initiate. Frass contains a compound (farsenol) that elicits larval synthesis of a bit of juvenile hormone &, although not in great quantity, can sometimes alter the pre-pupation hormonal ratios away from pupation. Hypothetically, your new breed's genetics might be more sensitive to frass concentration (ie: programmed to grow big by getting extra instar of eating). If your bin design is not already self-clearing of frass then I suggest you consider getting the late instar larvae out into fresh bedding (presumably sifting the bigger ones for transfer will be easier than rebuilding existing system if yours co-mingles larvae with more frass than seems ideal). Anyway, frass exposure reduction would be my 1st tactic since counting instars under different temperatures/humidity/illumination is more investigative work & costly. Would you say what temperature range you have been using? Again heritageacres, - While have a moment wish to elaborate. Again, I am assuming your mealworms were selected by larval size for breeding somewhere along the way. Over time this selectivity likely meant there was eventually inbreeding (big siblings picked). Inbreeds have more recessive genetic alleles & get more base-line amounts of mis-folded cellular proteins that need clearing out as part of cellular housekeeping. There are families of molecular chaperones inside cells (& also circulating) that are involved in getting the right protein configurations (folded &/or un-folded) as well as getting rid of the not suitable proteins. These are called "heat shock proteins" (Hsp) & common families of these are grouped by their size (molecular weight, expressed as a number representing how many Daltons); a commonly studied one for the insect Drosophila is Hsp70. Heat shock proteins are quickly made since they do not need messenger RNA splicing to be replicated (Hsp genes have no introns). They are not solely responding to high heat, but rather named as "heat shock" because in response to elevated heat that was how 1st noticed they existed. Among other conditions than temperature they do respond to humidity as well. One issue is what is the base-line level of a heat shock protein & what level of heat shock protein is induced by life conditions; there are also instances where the number of gene copies vary (I suspect you new stock have extras of some Hsp genes that leads them to copy out into Hsp proteins a greater quantity at any given time than standard size mealworm larvae) . Aside from any variation a larvae might have from it's genes (breeding, whether in-bred or out-bred) there are variations in base-line heat shock protein levels among the different larval instars of the same larvae. With the foregoing in mind let me try to simplify it's relevance to my preceding comment. Extrapolating from Drosophila experiments I'll relay the following. Reared at high density larval expression of Hsp70 is higher than otherwise & this increment of Hsp70 is induced by the level of frass (probably as well as nutrient limitation in some circumstances). Now, high density Drosophila breeding also leads to selective breeding for longevity (whereas, low density breeding does not lead to selective breeding for longevity). In general incidents of high heat exposure increases Hsp70. Yet even when the heat incident recedes there is a bit more elevated Hsp70 than otherwise (& this carries into adult life stage, with survivors exhibiting more longevity). What plays out under higher Hsp70 is essentially slower growth & I propose this is why your larvae take longer to finish with being instars. Hsp are involved in cellular micro-tubule dynamics & since pupation requires some cells' interior re-organization they are probably responding according to their breeding engendered heat shock proteins (which may just be a genetic function of theoretically extra Hsp copy number, more so than temperature or humidity you are keeping them at being the major driving factor). Very interesting! I've often wondered about how to get larger t. molitor naturally, without chemicals. I'm a bit envious of you @heritageacres! Wow I am absolutely blown away with your incredible knowledge! Thank you so much for taking the time to reply to my post!! Because I am simply curious- how did you become such an expert? Are you an entomologist? I had to read your posts several times to take in all of the info. You make some excellent posts. Thank you again. I will take all of your information and use to to hopefully fix my issue. I couldn't thank you enough! @EntoAaron- Thank you! However I think I may have done myself a disservice with the selective breeding. I attached a photo of my larges, compared to the "larges" purchased from a reputable website. In this photo the mealworm is about 1.5", but I regularly have them closer to 2"